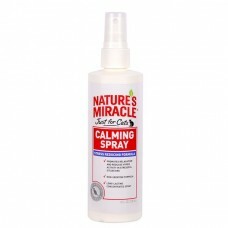 Nature's Miracle Calming Spray contains soothing scents which, when smelled by cats, help decrease anxiety. Cats are naturally skittish; the scents contained in Nature's Miracle Calming Spray help decrease stress caused by changes in pet's daily routine, such as separation and travel. The feeling of safety created by the scents will allow cats to relax without using sedatives. Spray Nature's Miracle Calming Spray wherever cat spends time when stressed and on carriers when transporting cat. Not intended to be sprayed directly on cat. Water, Herbal Extracts, Flower Extracts, Plant Seed Extracts, Essential Oils, Propylene Glycol, Diazolidinyl Urea, Methylparaben, Propylparaben.